It is a struggle for every photographer to determine the most appropriate rate for their photography services. Most would think that if they make their rates and charges low, they might be unprofitable given the fact that photography tools and equipment are, without a doubt, costly. On the other hand, if they increase their rates, no single client might hire and request for their services. In order to help you establish the most fitting price for your services, below is a short guide on how to create a photography price list. 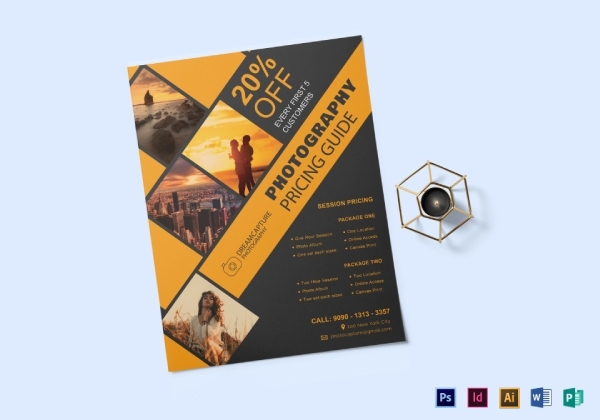 Additionally, useful photography price list templates and examples are also presented so you will be guided and have a basis for pricing your services. Creating a photography price list is burdensome for most photographers because they do not know where to start and what is the basis for their pricing. If you have a hard time determining the most appropriate price for your photography services, you do not need to worry for presented below is a simple guide in creating a photography price list. 1. Determine the standard photography rates. Knowing the rates of your competitors and other photographers will give you an idea of what are the standard photography rates around you. This is helpful so you will know the price range in order to limit yourself from not going beyond those acceptable rates and not going too low that your business might incur a loss. 2. Find out the different factors to consider when developing your price list. The factors to consider when developing a list for your prices are as follows: equipment, in which wear, tear, and repair costs should be taken into account; rent for the studio; marketing collaterals, such as photography flyers and posters; personnel, if you have assistants or accountant; labor cost for doing not just the capturing of photos but also the editing of those captured photos; and lastly, profit margin, which can be derived from your perceived value, competition ability, and quality of work. 3. Know the perfect photography pricing formula. The pricing formula does not necessarily mean the equation or the way to compute your pricing. Instead, this would imply the marketing strategies that you must apply such as the following: start big, stay visual, and be creative in your price list. 4. List down the services that you are offering and establish an appropriate rate for those services. After taking consideration on the standard rates of other photographers and knowing the factors to consider when developing your price list, you are now ready to enumerate all the service that you are offering, put them into an organized list, and make an appropriate rate for each of those items. Create a flyer that is not only visually pleasing but also functional and which features the different packages available as well as the price list for those packages with the use of this flyer template that is available in Illustrator, InDesign, MS Word, Photoshop, and Publisher file formats, making it very convenient for every user to download and edit the file. 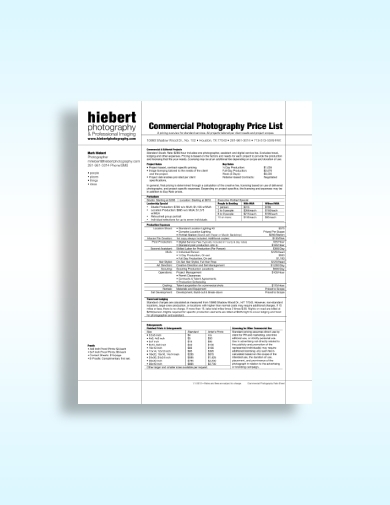 Want to own a professionally designed photography price list in order to make the greatest appeal to your target customers? 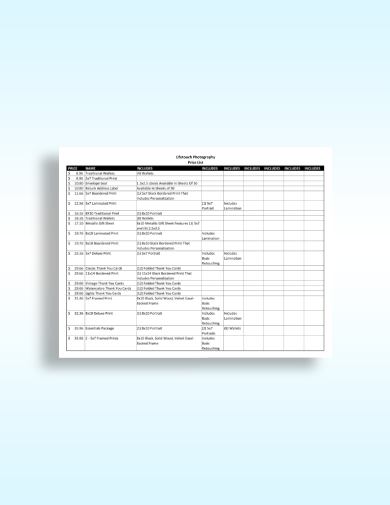 With the use of this basic photography price list template, you can surely achieve a functional and, at the same time, eye-catching price list that will encourage your potential customers to avail of your services. 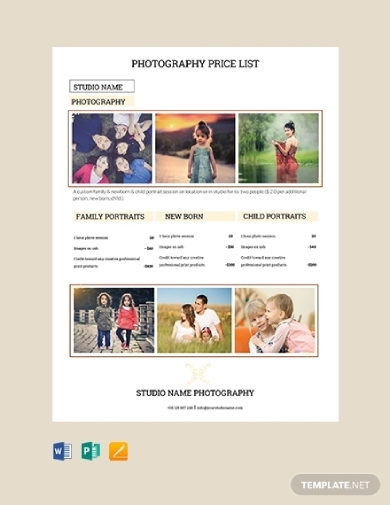 If you are into studio photography, the type of photography in which the photo shoots are done in an indoor studio, this price list template is definitely perfect for you. 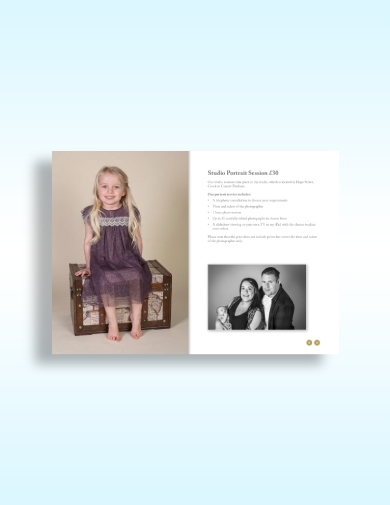 Through this sophisticated studio photography price list, you can expect an increase in the number of people being interested in your services because of your high-quality and well-crafted price list. Every professional photographer must create their own price list in order to create a name on the industry, stay on top of the competition, and cement their brand in the market. 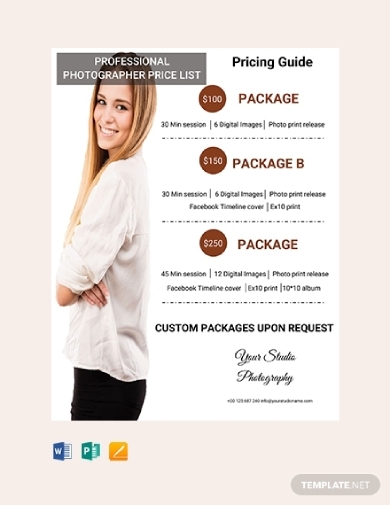 Hence, to help you make and design your list, you can use this professional photography price list that is easy to customize and personalize according to your specific preferences. 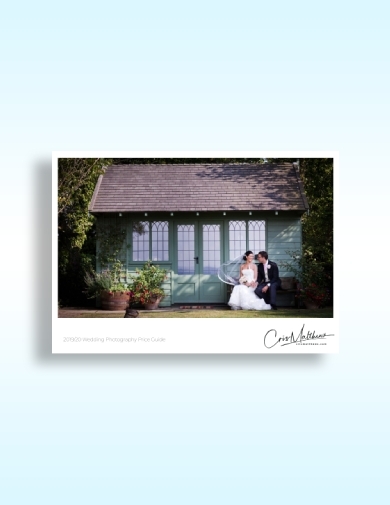 Wedding photographers are in demand nowadays since a lot of couples getting married would want a professionally captured photos as these will serve as their memorable keepsake of their wedding. 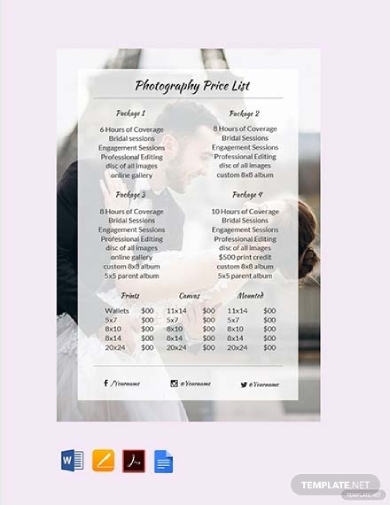 Thus, while you are putting extra effort in determining the most appropriate price for your services, you must also work on the aesthetics of your price list, such as this wedding photography price list template. In commercial photography, the scope of work ranges from taking photos for commercial use and editing those photos to be placed on advertising brochures, flyers, rack cards, among others. Include this and specify all other services that you are offering on a commercial photography price list, such as the example presented above. 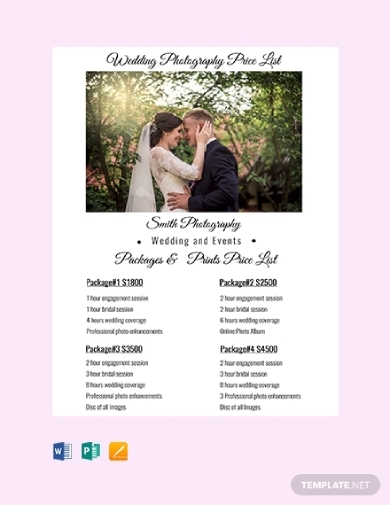 It is important that you list down all the photography products and services that you are offering, similar to this example, so that customers would have a quick summary on the available services that can be avail of and compare the different options or packages of your wedding services. If you are into portrait photography, that is, taking portrait pictures of the subject that feature his or her personality with the use of effective lighting, backdrops, and poses, it is best to have a well-designed portrait photography price list, similar to this example, in order for people to trust in your credibility and therefore establish your branding. Different photographers offer different packages for their photography services. 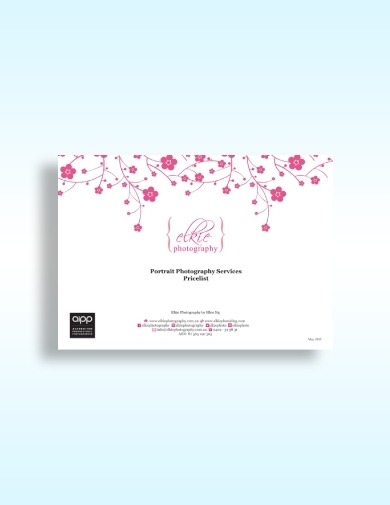 In order to provide your clients a complete list of the packages that they can avail of, a price list is needed, such as this photography services package price list. Modern photography involves photography from 1910 to 1950 in which the style used focuses and emphasizes on formal qualities of the subject may it be a person, object, or landscape. In order to promote this kind of services that you are offering, apart from your flyers, brochures, and posters, your price list will also serve as a promotional tool that will make your brand famous in the market.